Community Folk Art Center will begin the celebration of Black History Month in collaboration with WAER, by hosting a Black History Month Kick Off Concert on Friday, Jan. 30, at 7 p.m. The concert will feature singer/songwriter Lydia Caesar and local R&B band Brownskin with opening act Brandyn Thomas. This event, which is free and open to the public, jumpstarts the month long observance and celebration of African American culture. Caesar is a singer/songwriter hailing from Hollis, Queens. Her album “CAESAR” (2012), released independently, produced singles that gave her some major spotlights. Caesar has received radio plays on two of New York’s biggest stations, Hot 97 & Power 105.1, two music videos on BET’s 106 & Park, as well as a live TV performance of her song “St. Louis” on a national network morning show. Earlier this year, Caesar was selected to participate in the ASCAP Foundation Workshop “The Collective” and was a member of the trio selected for writing the winning song “Hook, Line & Sinker.” Having opened for heavy hitters like Trey Songz, Robyn Thicke, Brandy and a host of other artists, Caesar is no stranger to the main stage. Her electric stage presence has placed her in just about every major venue in New York City. Inspired by groups like Mint Condition, the Roots, and Tony! Toni! 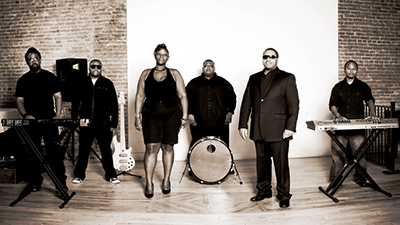 Toné!, the Syracuse-based band Brownskin was formed in August 2007. It got its name when founder Nate Brown combined his last name with his instrument of choice, the drums, more affectionately known as “skins.” With Brown on drums, Gary Carter and Danielle Mitchell on vocals, Joe Cummings on keyboard and vocals, John Dale on bass and Ekwan Brooks on keyboard, Brownskin is up and running and actively pursuing its goal of recording an original CD and using it as a means to spread its smooth sound and positive energy throughout the world.